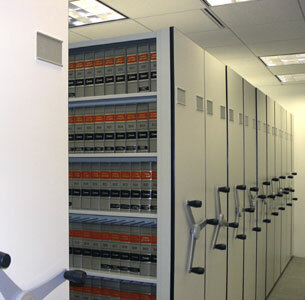 Since 1927, Adjustable Shelving has designed, crafted and installed innovative and economical storage solutions for a diverse clientele, including Fortune 500 companies and prestigious law and accounting firms. We now offer our newly designed Adjustable HD Series space saving, mobile storage system that elegantly balances the aesthetic, cost and durability concerns of architects, designers and facility managers with restrictive building codes and conditions. Our strong, yet lightweight, heavy gauge aluminum carriage design is the most intelligent high density system available. Adjustable HD Series systems can be installed in buildings that have floor weight load limitations that would preclude the installation of most steel carriage space saving systems. With our complete turnkey service, Adjustable HD Series systems are individually specified, and installed by factory trained professionals to meet the requirements of your particular site. Whether your application is a highly visible library, office or an unimproved back room, Adjustable HD Series space saving systems are an intelligent and effective solution for all of your high density mobile storage requirements. All exposed ends and backs are finished with either high pressure laminate or optional low pressure laminate end panels. High pressure laminate end panels are 3/4 inch particle board with .050 high pressure laminate. Edges are finished with a black plastic extrusion. Colors can be selected from Nevamar or Wilson Art color samples. Low pressure laminate end panels are 3/4 inch thick melamine laminated panels. Edges are finished with black plastic "T" molding. Colors as selected from Adjustable HD Series standard colors. Custom end panels are available, talk to your Sales Representative for details on designing your own. For "island" installations specify optional end panel with same colors as standard end panels. 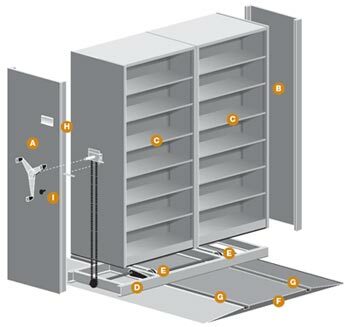 Specify Adjustable LR, R2, N&B or your own shelving up to a total of 30 feet wide. Shelving is typically two sided. Indicate paint color from the Adjustable Shelving Finish Guide. Carriages are made of special 6061T6 aluminum extrusions. The main support extrusion provides a 5/8 inch high lip to fasten and position shelving. Each wheel section supports a minimum load of 6000 pounds. Carriages support a minimum load of 1000 pounds per foot. Carriage and rail system adds 6.75 inches to the shelving height. Carriages are finished with a acrylic enamel to match shelving or a color specified. All wheels except guide wheels are 5 inch flange wheels supported by 2 shielded ball bearings. All wheels on one side of the carriage are connected together by a 3/4 inch shaft. On mechanical assist systems the line shaft is connected to the hand wheel assembly and geared for load requirements. The continuous line shaft provides a straight line positive drive system. Floor consists of 3/4 inch plywood fastened to flange of rail extrusion to provide a unified floor and rail system. All plywood joints are tongue and grooved to provide a solid and level floor joint. Finished floor covering provided by dealer or customer. A 19 inch ramp is provided for transition from existing floor to elevated floor to meet ADA requirements. Consist of special aluminum extrusion fitted with a 5/8 inch square 1045 cold rolled steel bar. Aluminum extrusion is designed to provide a slot for carriage to rail anti-tips, rail extrusions have a flange on each side to fasten to floor. Rail is leveled by use of leveling screws and continuous grouting under rails. Special rail systems are available to meet special floor loading requirements. (Consult Sales Representative) Plywood is supported between rails with leveling screws, spaced a maximum of 16 inches on centers. 4x5 inch aluminum extrusion with hidden fasteners holds standard 4x5 inch cards. The system is equipped with safety locks so user can lock carriage, with a simple quarter turn of the knob below the crank, when they�re in the aisle.